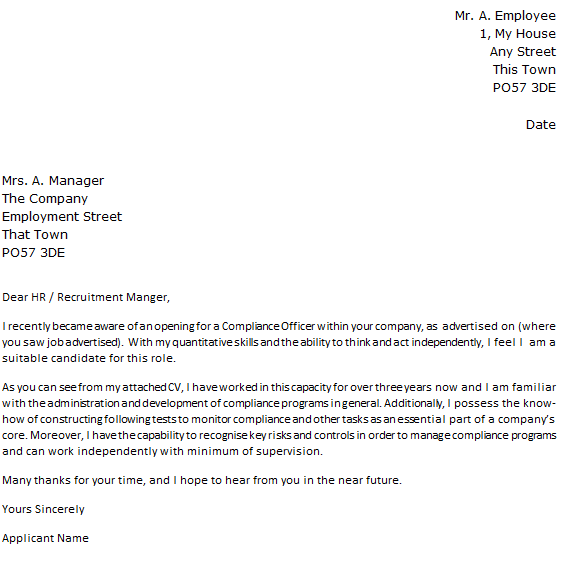 Writing a cover letter for the job role of a compliance officer. If you are hoping to be a compliance officer then you will usually be degree educated with a good understanding of the rules and procedures that businesses should adhere to. Your role as Compliance officer is to ensure that companies comply and follow the correct procedures. You will need to have good business mind for this role and excellent communication skills as you will spend a great deal of your time in client facing roles usually at their business site going through the laws and procedures that they should be following. The salary level for this role is from £18,000 for an entry level position or £24,000 with experience. This is dependent on experience and will increase with experience and the clients that you take on and provide advice for. This also will vary according to location of the role. Keeping up to date with new legislation and making sure your clients adhere to this Keeping accurate logs and records.Proving follow ups and reminders to clients for the next step or check that needs doing.This is a very important role and you will need excellent communication skills to be able to help your clients understand what they need to be doing at all times and helping them to achieve this. I recently became aware of an opening for a Compliance Officer within your company, as advertised on (where you saw job advertised). With my quantitative skills and the ability to think and act independently, I feel I am a suitable candidate for this role. As you can see from my attached CV, I have worked in this capacity for over three years now and I am familiar with the administration and development of compliance programs in general. Additionally, I possess the know-how of constructing following tests to monitor compliance and other tasks as an essential part of a company’s core. Moreover, I have the capability to recognise key risks and controls in order to manage compliance programs and can work independently with minimum of supervision.